Mara here from Switchboard. There are six days left to apply to PIE. I’m going to tell you why you should. So before we get started I want you to go and visit another three incubators’ websites. Just the first three that pop into your head. Go on. Take a look around. Check out the photos. Watch the videos. I want you to ask yourself this question: what is the culture of this incubator? Go ahead. I’ll wait here. Are you back? Hi again. Now please watch this video about PIE. Here’s the thing: the word incubator is problematic. It implies that you are going to enter into an isolation tank of like-minded, ambitious entrepreneurs. You’ll sleep under your desk, subsist on ramen, and meet all day with people in t-shirts and blazers. A white board and marker will be the most creative tools at your disposal. Here’s the other thing: companies are shaped by the culture of their incubator. Just like an artist (we’ll get to that part in a minute), the technology you create is a reflection of the ecosystem you are in. If you are in a sensory deprived cubicle tethered to your laptop mindlessly inhaling processed noodles in an office of people doing the same what you create will be informed by that environment. And until I discovered PIE, that environment looked bleak, homogenous, and unstimulating. If you want a sense of why I thought this this was the work I was doing prior to starting Switchboard, and this was the view from my front yard. Yeah. An isolation tank of geeks was my worst nightmare. I resigned myself to the fact that technology was completely incompatible with humanity, beauty, and delight. And then I discovered PIE. PIE is the most creative incubator in the most creative company in the most creative building in the most creative city in the world. So why is creativity important? Because creating technology is an act of art. As Paul Graham put it: “What hackers and painters have in common is that they’re both makers. Along with composers, architects, and writers, what hackers and painters are trying to do is make good things.”And every act of art is about stealing. Austin Kleon, the authority on creativity and stealing, said it best: “You are, in fact, a mashup of what you choose to let into your life. You are the sum of your influences.” So look for the incubator that will help you become the best thief, and steal from the most creative people, with the most diverse resources, so you can make the best thing. What do I mean by resources? Well, there’s all the stuff you already know. You will get money. You will get desks in a beautiful light-filled office. You will have access to generous, big-hearted, life-changing mentors. You’ll share the experience with other visionary companies. There’s free beer and lunch. Program directors Kirsten, Rick, and Renny will light the path with a disarmingly effective combination of competence, empathy, ball-busting, and sardonic wit. But if you look around, as I did, you will also get a schmorgasboard of an ecosystem. And you can gorge yourself. I want to share with you 20 parts of my ecosystem and the profound impact they had on the technology we built. Here, I’ve even made you a map. As you can see, 99% of this ecosystem is within a five minute walk of PIE’s office. 1. Our team is made up of whip-smart students funneled from nearby Reed College and Portland State University. The city is bursting with young, hungry, diverse, creative talent. 2. 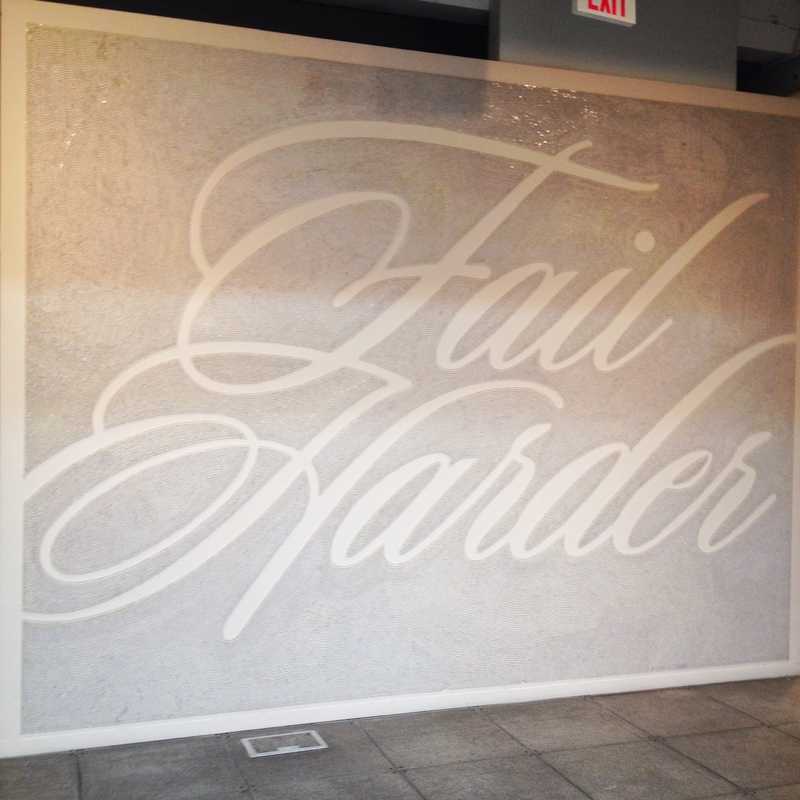 We are reminded, every day, that the work comes first, that the person with the best story wins, and to fail harder. 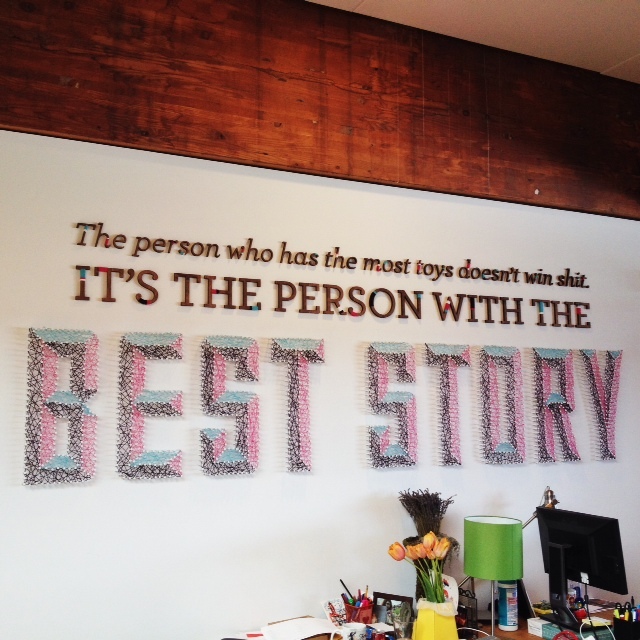 These messages are written in the walls of the Wieden+Kennedy. 3. 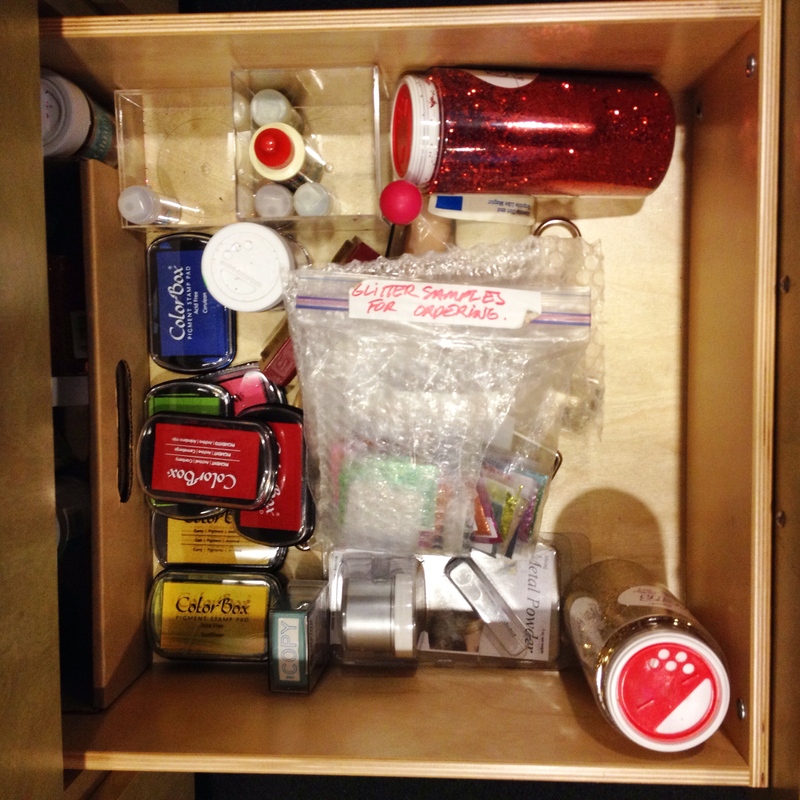 In this building there is a drawer of glitter and a letterpress in the basement. They emit a sonar of inspiration. 4. 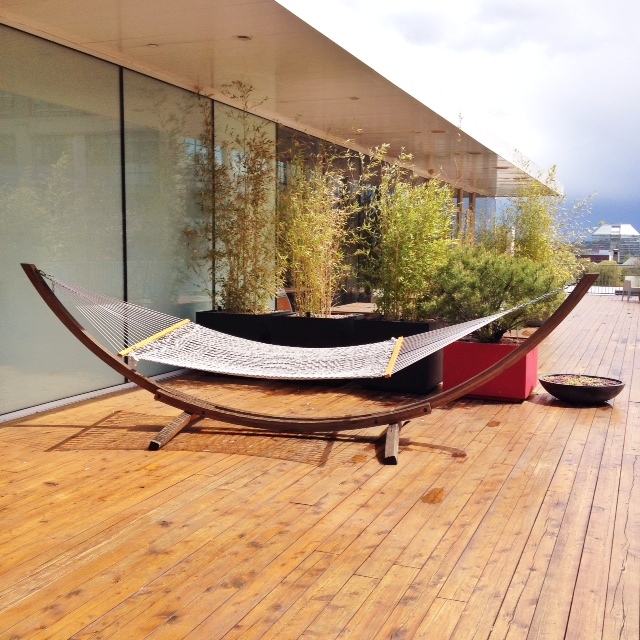 On the roof deck there is a hammock. In the summer there are parties and sometimes a chest freezer of popsicles appears. On clear days there is a direct view of Mt.Hood. 5. This is John Jay. His office faces 12th street. I’ve seen his light on at 1 AM. If you are working half as hard as John works you might be on the right track. 6. 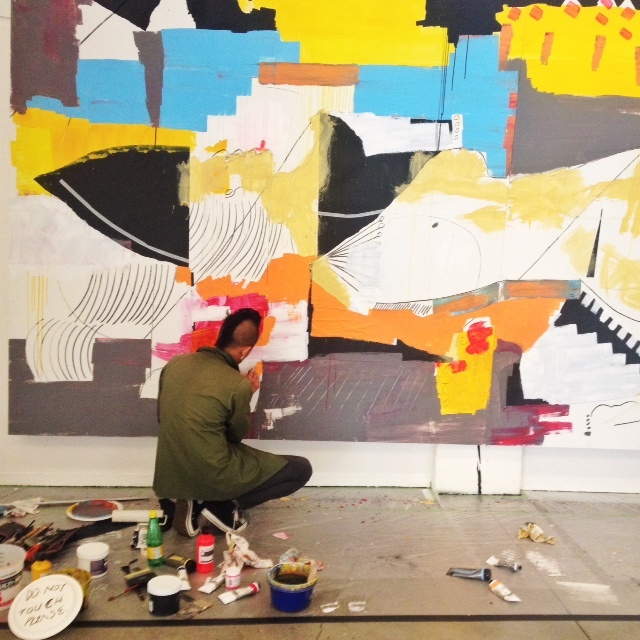 Wieden+Kennedy commissions artists to make art in their lobby. When I’m sick of staring at my computer I can watch people live paint. Wat. 7. 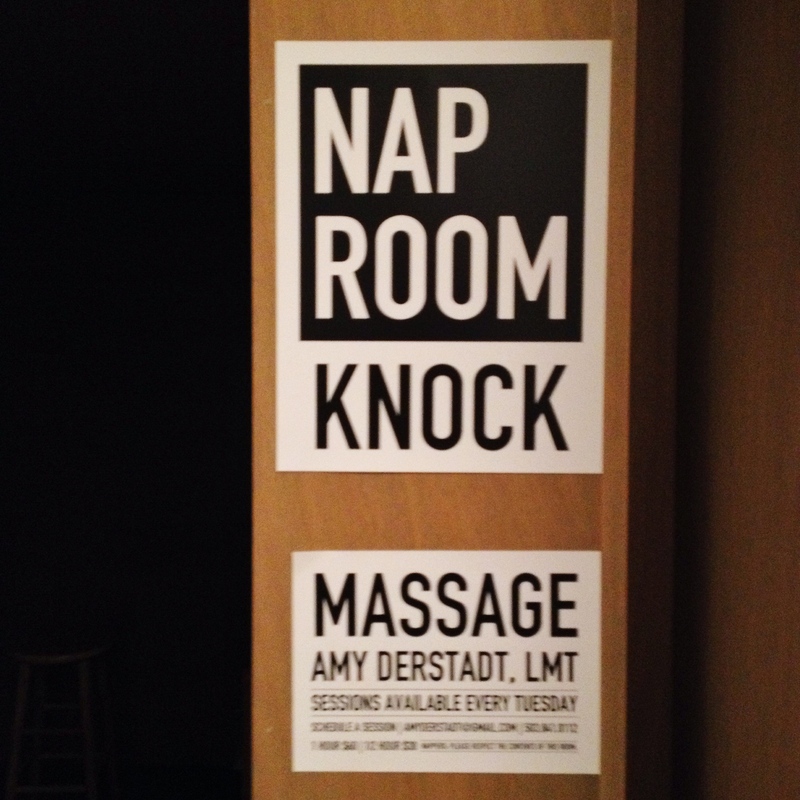 When I’m tired, I can take a nap in the nap room. Or get a massage. 8. 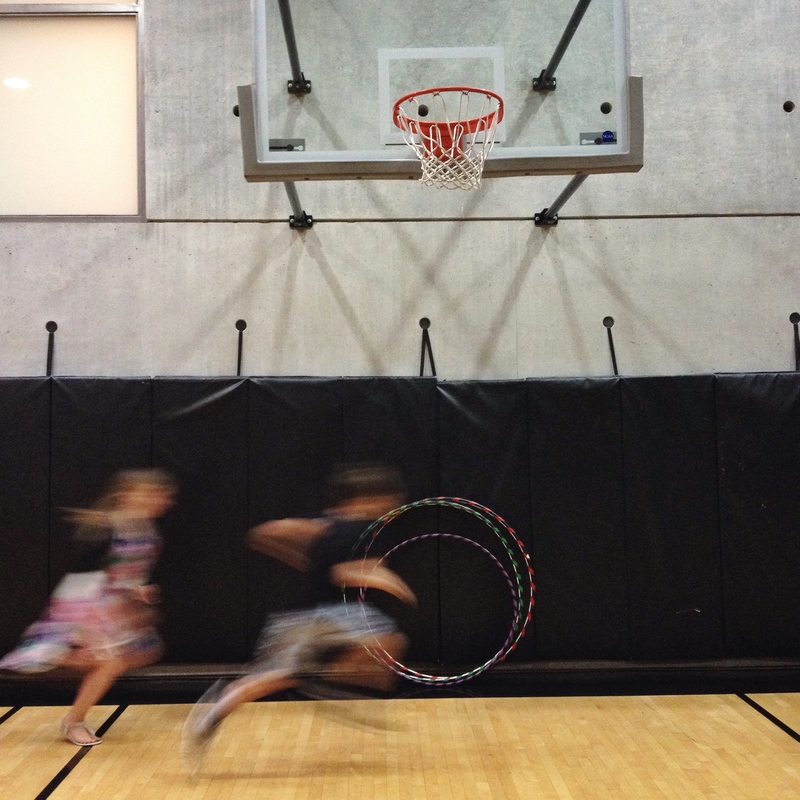 When I’m lethargic I hoola-hoop to Snoop Dog on the basketball court. Sometimes I’m joined by random children. 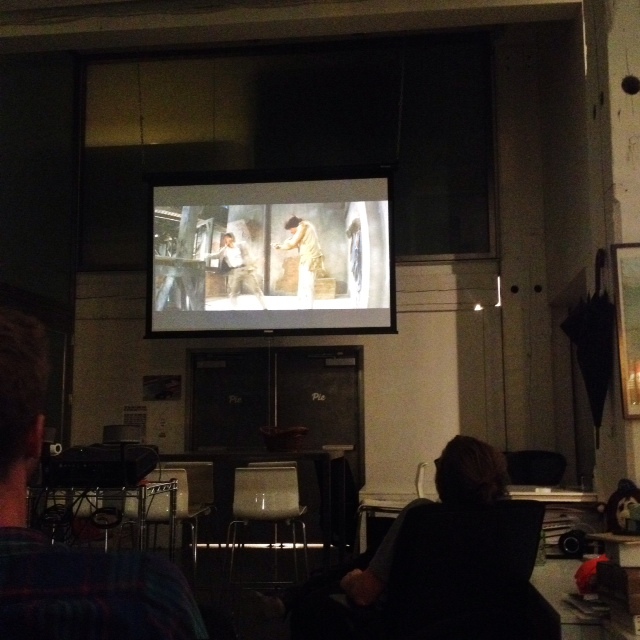 This weekend we watched Drunken Master in the office. 9. There is also a human sized nest. 10. 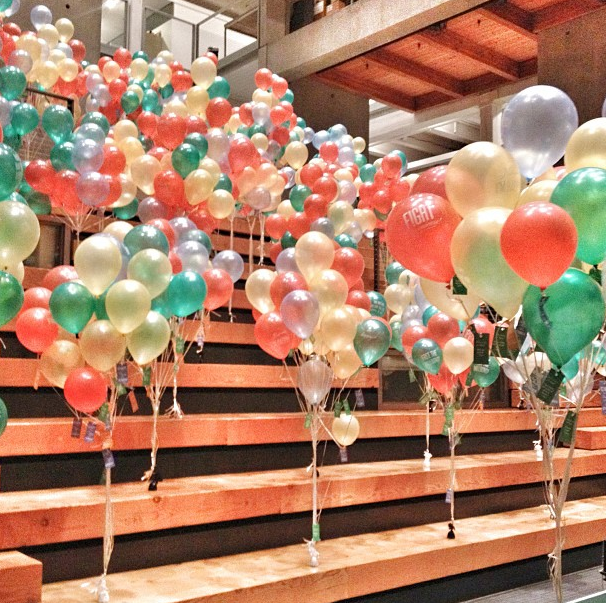 This one time, Pink Martini performed in the lobby amidst 6,000 balloons. I could go on. Let’s leave the building, shall we? 11. A few blocks away is the largest new and used bookstore in the world, Powell’s. I’ve spent entire days reading on the floor. 12. Around the corner you’ll find Maurice, a pastry luncheonette started with a Kickstarter campaign. I go here to be reminded of what can be made on a shoestring. 13. I’ve been schooled in the art of customer service at Nong’s, a Thai chicken food cart. Nong is the local entrepreneur I admire the most. 14. 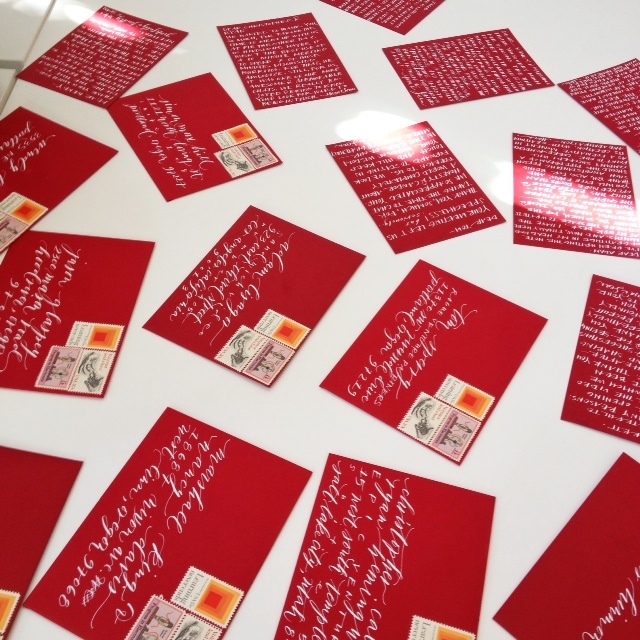 Thank you cards are our most important business expense. We buy them at Oblation and Blick Art Supply. 15. Observing the operations at the Ace Hotel, Stumptown, Heart Coffee, Canoe, Multnomah Whiskey Library, Blue Star Donuts and Tilt has taught me so much about marketing, workflow, and customer experience. 16. I could go on about the city’s cultural offerings: Creative Mornings, ADX, XOXO, TechFest Northwest, DesignWeek, the Yale Union, the Portland Art Museum. Have I mentioned the nature? And then there are the artists and makers. The number of people doing awesome things here is startling. 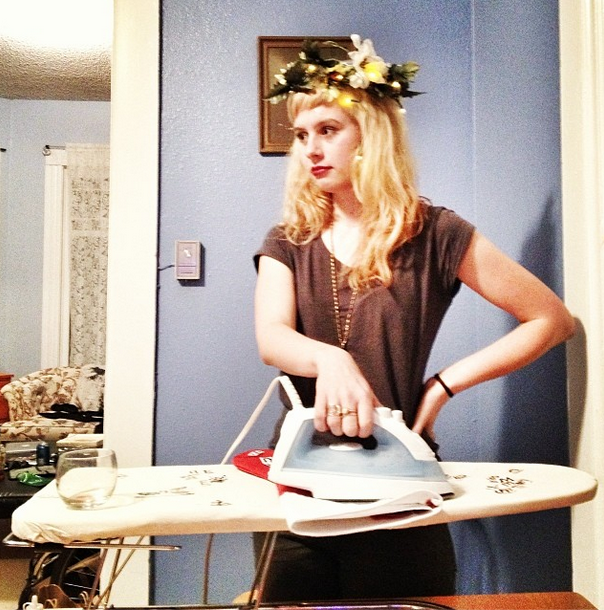 It’s like a 21st-century Florence. It’s intimate, scrappy, collaborative, boot-strappy and on the brink. 17. When I started PIE I didn’t know how to breathe or turn my mind off. I learned both through a daily practice at YoYo Yogi. 18. There is an abundance of crappily written but useful business books. There is no need to buy them. I check them out from the Multnomah Public Library. 19. Then there is Peter. He sells the Street Roots newspaper in front of the nearby Whole Foods. He’s my Patron Saint of Perseverance. 20. When I forget what matters in the world, what really matters, I stand in front of these doors. So, look. Perhaps making software in an acultural vacuum is your jam. This factory farm incubator model is the rule, not the exception. Switchboard would never have grown, let alone flourished, out of this arid soil. I’m writing this love letter to the handful of people reading this who dream of something else (this is sounding eerily familiar..it’s different, I promise). You’re a resilient, resourceful, rule-bending scamp who thrives on making something from nothing. You’re more interested in building the world’s best rainbow, not discovering the pot of gold at the end. You can stop looking. We’re waiting for you. Join us. Mara Zepeda and Sean Lerner co-founded Switchboard and met on Twitter. 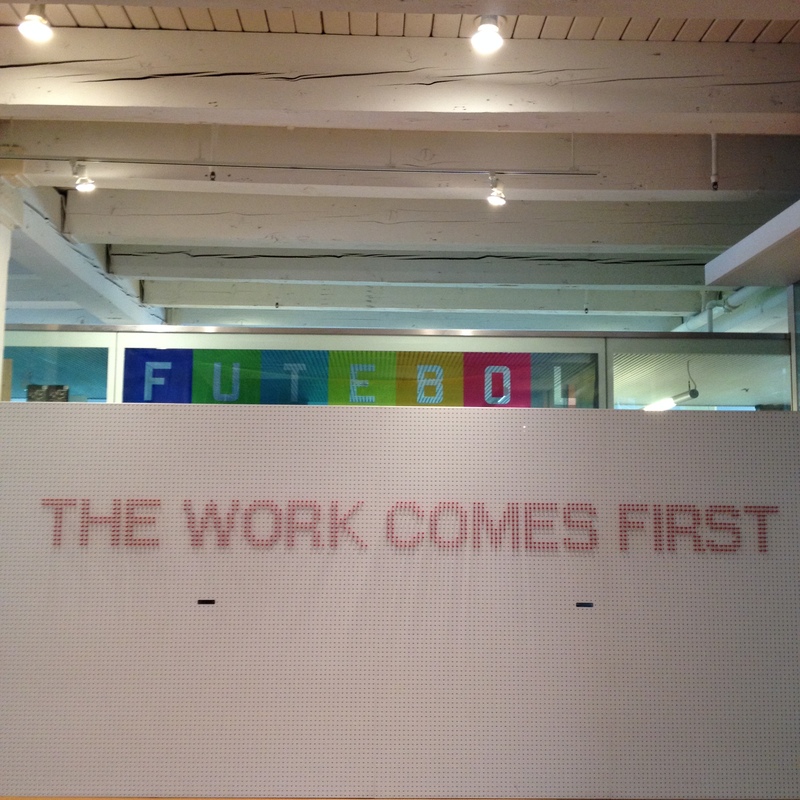 This entry was posted in Alumni, Community and tagged Culture, incubator, PIE Alum, portland, startups. Bookmark the permalink.